In the late sixties, the Swiss Army acquired two VHF transceivers from developed for the U.S. Army Signal Corps: Tha manpack set SE-227 and the SE-412, a VHF medium power station designed for mobile use onboard vehicles. In the U.S., this set was quite common and carried the designation VRC-12. Often used with AT-912 whip antenna connected to the antenna tuner MX 2799. The transceiver covers the military VHF frequency range divided in two bands: the A Band 30 - 52,95 and B Band 53 - 75,95 MHz wil make 920 channels with 50 kHz channel spacing, the transmitter output power is switchable, in position POWER LOW it is 1 - 3 W which will give an operation range of ca. 5 km, in position POWER HIGH the operation range is extended to 20 - 30 km when the longer ship antenna is in use. On the front panel, You find in the left upper corner the indiactor lamp CALL indicating a transmission opening up the squelch circuit. Next to it, You find the band selector for A and B band, just below the frequency selector knobs for the MHz and kHz digits, the active frequency is displayed in a small window. In the left lower corner, You find the SQUELCH switch: in position SQUELCH OLD, the receivers A.F. stages are opened, when a signal is active on the selected channel, in position SQUELCH NEW, a 150 Hz tone emanating from another SE-412 or SE-227 will open up the muted audio output. The volume control is positionned just next to it. At the right of the frequency chart, where You can write down the standard operating frequencies, You find the dial illumination and the loudspeaker switch, below the main switch and the switch to select low and high transmitter power. Below, in the middle of the frontpanel are the connectors for relay operation, for the microtel (radiotelephone handset with push-to-talk button) and the connector for the automatic antenna tuner. At the right, You find the speaker covered by an impact protection speaker grill, just above the antenna jack. The Auxiliary receiver consists mainly of the receiver section of the transceiver with all necessary controls for the receiver. It is used to receive communication from the superior command while You are communication with other groups or platoons in same unit on another frequency channel on the main receiver. 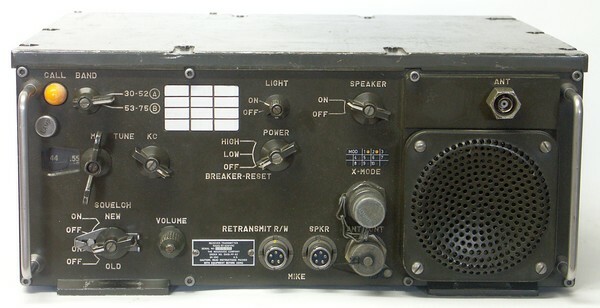 In command vehicles, the SE-412 came in the SE-412ABC configuration: One transceiver (A) is used to keep in contact with the superior authority, the second transceiver (C) is used to contact subsidiary troops and the auxiliary receiver (B) is used to monitor a third channel. As an accessory, the on-board intercom AM-1780 has been used on Swiss tanks. To form a relay station of two SE-412, there is a relay switching box C-2299/URC.